Who likes pancakes more than anyone in the world? I want to share the joy of pancakes with you. I want to thank you for being a reader. 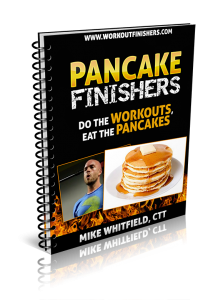 I couldn’t think of another way to thank you other than create these MONSTER workouts and finishers followed by instructions to eat pancakes after each workout. I’m weird like that.